This is for you people. That is a about half true. It is also for me. As I have mentioned before, I like to write a little bit ahead of what I am posting online, just in case I need to go back and fix some minor thing. (Like someone having a conversation a chapter after I knocked them unconscious. It’s a real problem.) Also I like to give myself the opportunity to go back and reread a day or two later and make edits when I am no longer actively creating a scene. To keep you on the edge of your seat, I really shouldn’t post so quickly. But I couldn’t help myself! I’m on the edge of my seat! I just finished writing a new chapter, and it had me so excited, I had to post something else for all of you. Please. Read. Enjoy. Comment. I hope you are on tenterhooks too. Figuratively, of course. That would be gross. I read this a few days ago and have been thinking a lot about it lately. I really have been enjoying the story so far. 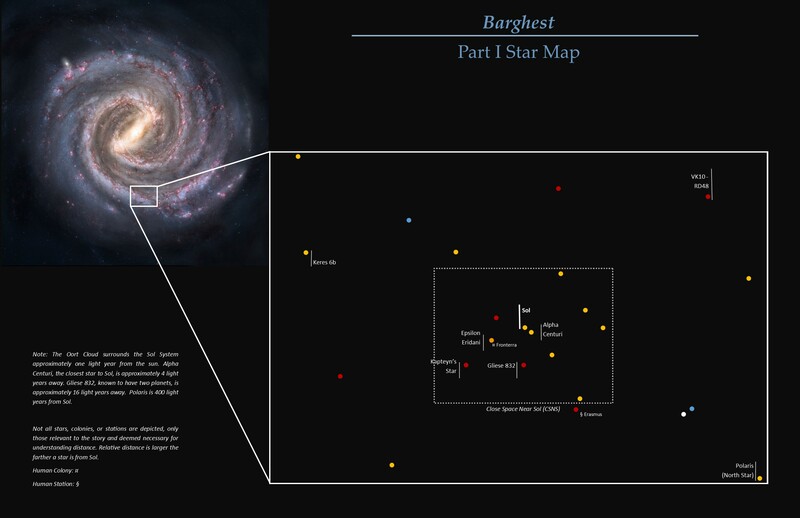 I would love to see a map of the galaxy and some of the places that are talked about. Maybe a diagram to show the different classes of ships? Those would be really awesome. Are the Cullers genetically engineered soldiers by another race? Maybe the reason they are digging tunnels full of water is that the other race is a water race? They are possibly helping to terraform other planets for the water dwelling race? I’m excited to read more! I can’t answer all of your questions – spoiler considerations – but I have provided a map for you!